I went on a John Green book kick recently. I read three of his books in the last 4 weeks I think. So here they are and one non-Green book thrown in for good measure. “Despite the tumor-shrinking medical miracle that has bought her a few years, Hazel has never been anything but terminal, her final chapter inscribed upon diagnosis. But when a gorgeous plot twist named Augustus Waters suddenly appears at Cancer Kid Support Group, Hazel’s story is about to be completely rewritten. I happened to finish this on the flight out to Vegas. Maura and Kirra can attest to the fact that I balled when I got to the end. I mean, I was really crying, not just a small tear up. It was really one of the best reads I’ve had in a while. This book takes readers all over the Orlando area, which for me was like going home. It was neat to recognize all of the different locations as a former Central Floridian. Yet another one that I really enjoyed. He does a very good job of painting a picture of teen angst that is real, not just I didn’t get the jeans I wanted real. There are themes that run through John Green’s books, especially the second two in my list and that is about how well do you really know someone. Do you ever really know the real person or do you just know the person you have created in your head. We humans tend to project a lot on other people and don’t always understand the person for real. John Green really explores that in these second two novels. Since I was reading somewhat depressing coming of age books, I figured why stop at John Green books. In this case, I saw the movie before I read the book, I usually don’t do that. I really liked the movie though, both that and the book are set in Pittsburgh though, so that helped. The writing in this book takes some getting used to. The author wrote it as if Charlie himself was writing to us, so it reads like a diary entry of 15 year old boy. Once you get used to it, it isn’t so odd. Again, this was a great book that I’d definitely recommend reading. So I really did like all of these, however, if you need something uplifting, DO NOT choose one of these. They are poignant, but not happy reads. I decided to make an easy dinner tonight to take down to see Shaun, Shannon and Sarah. I’ve decided to take Sunday night with Sarah when I can and when Shaun and Shannon aren’t busy or tired! Look at how cute the girl was tonight, this is what she had on at church. 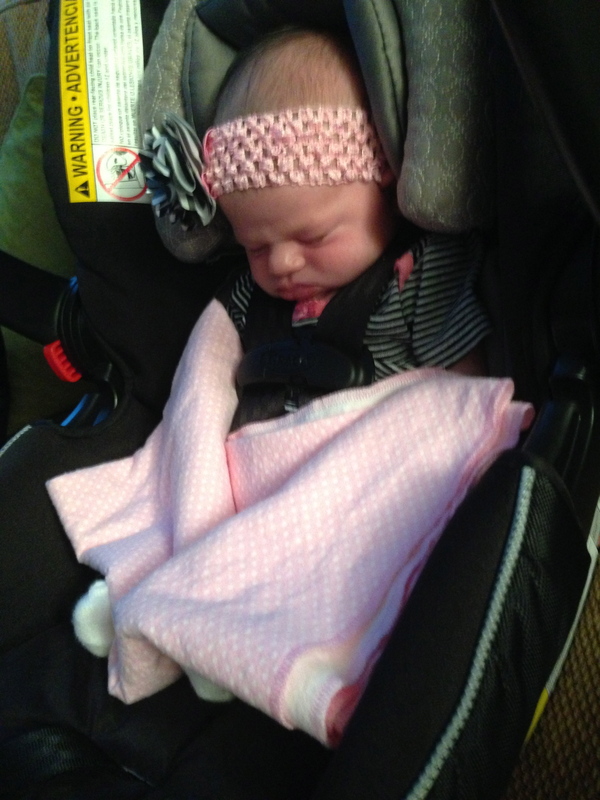 Look at that adorable headband, that her dad picked out I will add! She was so well coordinated. Since I bribe her parents with dinner in exchange for getting to hold her for an hour or two, I took them dinner. I found an incredibly healthy vegetarian dish a while back called tempeh tamale pie (or something along those lines). 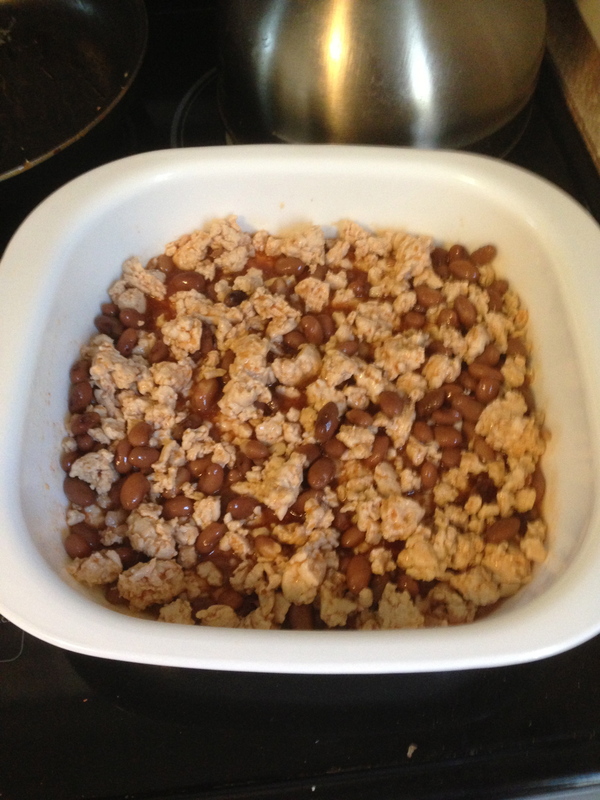 This recipe used tempeh (which is a soy product,) I subbed ground turkey breast. Also, in the original recipe she made the sauce and corn bread from scratch (and vegan), I just was not up for that so I decided to make something a little more my speed while trying to keep it a little healthy. My effort is to make sure as much of it as possible is organic, this one is about 75% organic ingredients. So here it is! 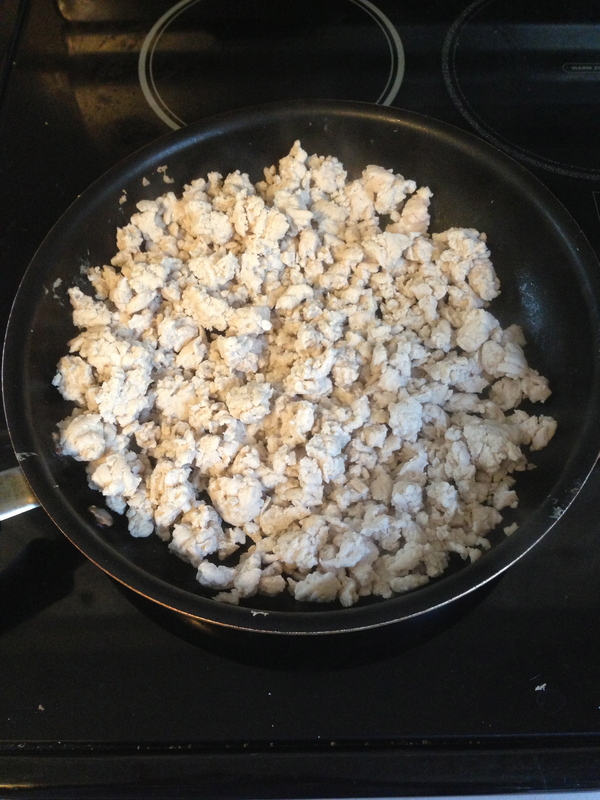 To start, brown the ground turkey breast. 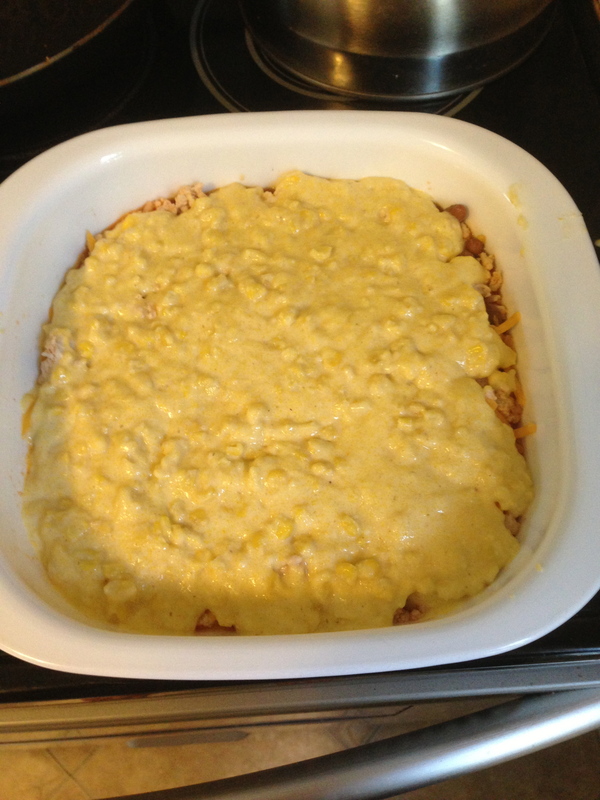 While that is browning, I thawed the corn and mixed together the corn, egg, milk and corn muffin mix in a bowl. 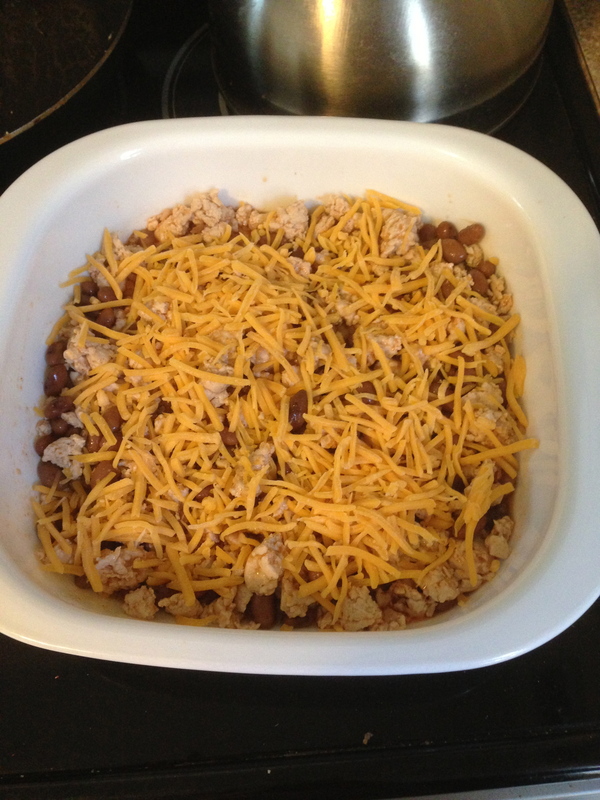 Once the meat is done, mix together the kidney beans and enchilada sauce and place in a baking dish. Bake this at 375 for 25-30 minutes or until the top is browning. I didn’t take a picture of the done deal because I wanted to get down to Shaun and Shannon’s! This is a super easy dinner to throw together and really isn’t all that bad for you. It will make 6 servings unless you are really, really hungry. It has 347 calories and 9 grams of fat. I think this was a hit with Shaun and Shannon, they said they liked it and I certainly did. I took a small simple salad (romaine lettuce, tomato and cucumber) as a side to make sure we got our veggies. I will absolutely trade food any night if I can spend some time with miss Sarah. I got to feed her tonight and she was cracking me up. First, while the poor girl was sleeping, she let rip an adult soundeding fart. I mean, Shaun was in the other room and asked if it was Shannon or me. I’m recording this for posterity to embarrass her later in life. Second, after I fed her and was trying to burp her, she kept smiling as I was patting her back (and refusing to burp btw). I mean, it was like she was mocking me as I was giving her a shiatsu massage. I finally got a burp out of her, it just took a while. I have a note on ground turkey since we were talking about this tonight. I’m a HUGE fan of ground turkey breast in place of ground beef in almost everything. My two exceptions are burgers (even though I love a good turkey burger, they just don’t have the same taste) and meatballs or meat sauce when it comes to spaghetti. Don’t get me wrong, I’ll sub ground turkey breast for myself in meat sauce but I wouldn’t do that if I was cooking for other people. Anyway, my point tonight was about ground turkey vs. ground turkey breast. To me, there is nearly ZERO point in buying ground turkey unless you are really worried about your cholesterol because I’d almost always rather buy the lowest fat ground beef over the regular ground turkey, you just don’t save that much fat unless you are buying the ground turkey breast. The lesson here is that if you are really concerned with controlling fat and think you are being super healthy buying ground turkey, you really should be looking for ground turkey breast in my humble non-dietician, self-educated opinion. I’ll get off my soap box and get ready for sleep now. BTW…How about those VMA’s, I haven’t watched this in a while, I’m glad I did tonight. I love Justin Timberlake and he got a few awards and put on QUITE the show. I just adore him… Jessica Timberlake is a lucky lady (and he’s lucky to have her)!!!! I realize that I’ve completely neglected this blog for about the last month. What can I say, it’s been a hectic few weeks. I had another little trip to Florida, a wedding and a sick cat. I wasn’t really focused on doing much movie watching or inventive cooking. So, tonight I’m going to review a movie that I didn’t see in the theater but that I rented tonight. I decided to watch 42 tonight because I really should have seen it in the theater. So I cried once in about the first 15 minutes. The fact that there was a time where it was common to treat people the way Jackie Robinson was treated (especially in the south, no offense southern friends) makes me sick to my stomach. My mom told me stories about a road trip my grandmother took her and her siblings on down to Florida when she was young and they had never seen a “colored” bathroom or water fountain before. My mom went to ask my gram about it and got shushed very quickly. She was also told not to even DARE mention that they were Catholic as that was pretty much the same in the south as being African American in the 40’s and 50’s. Anyway, back to the movie. Some of the interesting parts of the script was how the GM of the Brooklyn Dodgers asked him to be both an amazing player and a gentleman and not respond in kind when attacked or provoked. I can’t imagine how difficult it would have been to stand there and take being yelled at. I admit, I loved Harrison Ford’s portrayal of the GM, Branch Rickey. He was gruff and awesome and ahead of his time. He knew what he was doing, he knew that there were amazing athletes out there being overlooked because of their color and he was willing to make a HUGE leap to take baseball to the next level. Jackie Robinson was played by Chadwick Boseman and he did a fantastic job. And though it was a smaller role, I adored Nicole Beharie who played Rachel, Jackie’s wife. One of the first scenes where she reacts to seeing her first colored bathroom and proceeds to walk right into the “white only” bathroom was fantastic. The amount of pressure put on Jackie Robinson to represent an entire race that was on the brink of a civil rights revolution was immense. I know they always take liberty with stories when they write “based on a true story” scripts, but I’m sure that much of what was written was absolutely true. I enjoyed this movie, the dialogue seemed very real and the performances were all very good. The scene where the Phillies heckled him was true (I looked it up). And it was also true that that moment did more to unite the Dodgers than anything else. There are three movies out right now that I’d like to see. The Butler, The Mortal Instruments and The World’s End. All very different, right? !